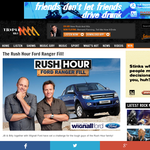 JB & Billy together with Wignall Ford have set a challenge for the tough guys of the Rush Hour family! If you think you've got enough mates to fill a Ford Ranger in a very short time, you could be up to the challenge and walk away with $5,000 in your pocket! Register below tell us all about your mates and JB & Billy could pick you to join them at Wignall Ford on Friday for their Ford Ranger Fill! Just like the Ford Ranger, being tough is not enough, and you'll have to be smart about this one… just ask Bill, you'll have to fit him in there too!